Yes, folks, its that time of year. The time when posters of consternated anthropomorphic vehicles with cute faces get plastered all over government buildings and mysterious official envelops get dropped in your mail slot. It can only mean one thing...time to pay your annual automobile tax! What is an Automobile Tax? The automobile tax (jidosha-zei 自動車税) is often confused with the "vehicle weight tax" (jidosha juryo-zei 自動車重量税) which is a national tax levied by car weight and paid during your bi-anual shaken (車検) car inspection. The auto tax is, in fact, a local tax levied by various prefectures. There is a fixed basic formula set down by law, but some prefectures off varying discounts for the elderly and disabled. Unlike the shaken taxes which are lumped into the price of inspection, you have to pay this tax on your own. And don't forget, a stamped auto tax receipt is required for your bi-annual inspection. The auto tax is only levied on regular cars with white license plates. Smaller kei-jidosha (軽自動車) with yellow number plates, mopeds (under 50cc), small bikes (under 600cc), and mini-cars pay a different tax called the "light vehicle tax" (kei-jidosha-zei軽自動車税) . This tax is levied by the municipality (ward, town, city, etc. ), rather than the prefecture. Trucks and buses are taxed under a separate bracket. Large trucks are assessed based on total, non-loaded tonnage while buses are taxed according to the number of seats. Special vehicles like ones owned by municipal and national government entities are tax exempt while other special vehicles like mobile cranes, campers, and trailers are taxed under a separate system. The auto tax was originally conceived as a means of funding local infrastructure. 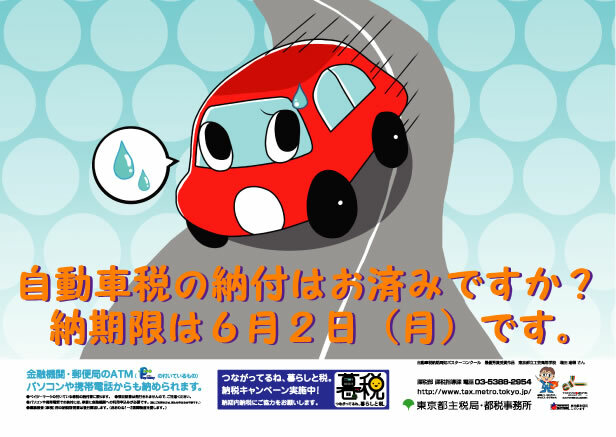 Although the tax money is primarily used for road maintenance and repair, the auto tax is now a major cash cow for prefectural governments. As long as a car is officially registered, it is considered taxable regardless of how often it is used. For regular cars, the auto tax is assessed by the total engine displacement as measured in cc's (cubic centimeters). Unlike many state car taxes in the US, it is not an excise tax and has no relation to the car's total resale value. The tax is paid for a one year period starting on April 1st. The actual bill will usually be printed at the beginning of May. Due dates differ by prefecture, although most have a cut off of May 31st. Regular cars are divided into two tax categories: home use (jika-yo 自家用) and business use (jigyo-yo 事業用). Cars registered for business use are taxed at a much lower rate compared to home-use vehicles. Naturally, you have first prove that your vehicle is vital to your business before you can register it as a business use vehicle. The exact cost of standard home and business use vehicles can be found below. In 2002, a new Green Tax System (guriin-ka zeisei グリーン化税制) was put into place that levies an additional 10 percent tax on older vehicles that are less efficient. If you have a gasoline vehicle older than 13 years or a diesel vehicle older than 11 years then you need to tack another 10 percent surcharge onto the above price. However, newly purchased cars can receive 50 percent off their first annual tax bill provided they are "low environment impact vehicles" (tei-kogai-sha 低公害車). This includes electric vehicles, clean burning gas vehicles, and fuel cell vehicles. Regular new vehicles which exceed 2017 JC-08 emission standards also qualify for a tax break of 50 percent. Vehicles who meet 2017 emotion standards qualify for a 25 percent tax break. These tax breaks are only valid for the year after the first new registration and do not apply to used car sales. As mentioned above, light vehicles (mopeds, mini-cars, kei cars, etc) are taxed by your local town or ward under a different "Light Vehicle Tax" system (see below). The above figures only represent the standard rates and municipalities are allowed to raise the basic tax rate to up to 1.5 times the national standard. So don't be surprised if your light vehicle tax is a bit more expensive than the norm. Think the annual vehicle taxes are expensive? Don't worry, its not just you. Accord to the Japan Auto Manufacturers Association, Japanese car owners pay 2.4 times as much as their German counterparts, 1.4 times as much as the British, 6 times as much as the French, and a whopping 14 times more than American motorists. The taxation counter officially starts from April first, although tax forms start getting sent out at the start of May. Like many official tax related things in Japan, the bill is usually long and rectangular with three separate perpetrated sections. Luckily, just about every prefecture and locality lets you pay your vehicle taxes at the local convenience store. Plus, you can also pay at any upstanding financial institution within the prefecture or prefecture tax bureau (for regular auto tax) or city office (for light vehicle taxes). Most prefectures give you the option of setting up a yearly bank transfer instead of having to traipse off to the convenience store with way too much cash in your pocket. However, the procedures for setting up an automatic transfer vary by prefecture. For example, my prefecture (Nagano) only allows payments from select financial institutions and for some reason JP Bank (post office bank) isn't on the list. To sign up, you have to get and fill out the forms directly at the bank teller window. Other prefectures like Osaka have taken brave steps into the digital world and allow for online credit card payments (for a small 300 yen fee or course) that can be done online. If you do opt to pay via bank transfer or credit card, you will relieve a proof of tax payment (nozei sohomei-sho 納税証明書) in the mail after the bill is processed. This can be a used for your bi-annual car inspection. Regardless of how you pay, make sure to tuck the receipt away with your important car paperwork as you will need to show it come shaken time. If you lose your receipt then you are going to have to go down to the local prefecture tax office or city office (in the case of light vehicle tax) and fork out money for a copy of proof of tax payment. If you buy a new car, you will have to pay a prorated auto tax when you purchase your vehicle. Not surprisingly, many people opt to buy cars in March since tax assessment for the new year starts in April. If your car sell your car and have it decommissioned by the dealer (massho toroku 抹消登録), then you are entitled to a prorated refund of your yearly tax. Basically, you only have to pay for the time in which your car was legally registered. This only applies to decommissioned vehicles, not to vehicles whose title has been changed to a different owner. Once your car is decommissioned then you will receive a notice from the prefecture or town depending on the car type. Most prefectures allow you to request a bank transfer or go to a designated financial institution and receive payment in cash. If you move prefectures and change your registration address, your old prefecture is required to remit the remaining tax balance to your new home prefecture. All of this should be done automatically. Since automobile tax is big money for prefecture governments, non-payment isn't taken lightly. If for some reason you fail to make a payment on time, you are liable for a late payment fee of 14.6% of the total bill plus the original amount. Continued delays in payments will likely result in the prefecture putting a lien on your bank account and taking the money by force. Some prefectures even go as far as impounding delinquent automobiles. You also cannot get a shaken without a tax slip and driving around in an uninspected car is ground for up to six months in the clink and/or a 200,000 fine plus 6 demerit points on your license. Have any other questions or comment regarding annual vehicle taxes in Japan? Make sure to let us know in the comment section. I am driving another foreigner's car. This foreigner has left Japan, and this tax has been addressed to him, the owner. My boss tells me I must pay his tax in his place since I used the car. Will I personally be penalized as user of the car (money withdrawn from my account, myself arrested, etc.) or will other guy's car be impounded? Thanks for the information. This was very helpful and I landed on the right page. Cheers! The insurance and weight tax are not "lumped in". They constitute 98% of the fee and run about 26k yen each for a mid-sized car. The actual inspection cost is only about 1400 yen. But most people are afraid to do their own shaken so they pay a dealer or Autobacs/Yellow Hat/ Holiday Shaken about 30k-50k+ extra to do the inspection for them. As mentioned in article, the tax is based upon engine displacement. So, yes, in a general sense sports cars have a higher tax. My car's Shaken was over a few months ago. If decide to Shaken it again in the middle of the year, do I have to pay the Full annual tax fee or just for the rest of the year? Also, someone told me that driving a car without shaken has no jail but a 25,000 yen fine and some taken points which is different with what you mentioned. Thank you. I have moved house and registered my new address at the local ward as required. My motorbike dealer told me that I don't have to worry about my Light Vehicle Tax forms for my 2 motorcycles, they will be sent automatically to the new address. But now it's already well into April, and I have not yet received anything. Do you know if I need to inform someone else about the change of address? And how about the address on the driving license? I think, vehicle tax is bound to your / your vehicle's parking lot address. You need to change the address of your vehicles (vehicle's parking address) registration. Most likely your tax slips couldn't reach you at your old address and returned to the local automobile tax office. Ask them at the office, they know the procedure. Your new address on the license can be changed at the local police headquaters. Very useful, thanks. If I allow a motorbike to run out of shaken but don't get it officially decommissioned will it still attract this tax? How can i pay my road tax if i lost my paying receipt? Just got my first car tax as I just bought this car 6 months ago. I used it primarily for work. Any idea how to go about proving its used for work? Hi what will be the tax on vintage bikes or bikes from 2000 to 2010? And do they get additional tax for an old model or not? Thanks for the info. Im currently buying a used car in Hokkaido and the current owner wants me to pay the road tax when I buy the car as it expires in two months. I may only keep the car for a month so it doesn't make sense for me to pay for a whole year if Im going to sell the car after travelling. Also I will likely sell in Tokyo. Is it possible to transfer road tax to a new owner? Then I can pay it when its due?